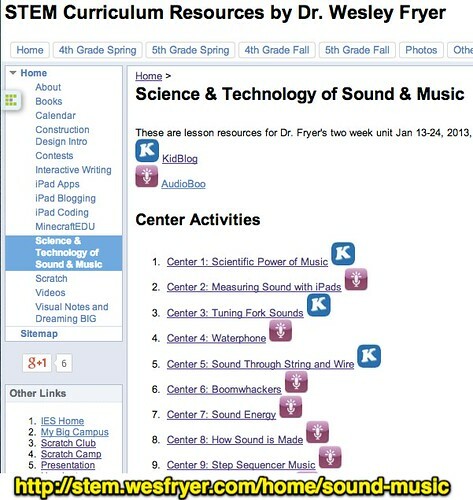 The past two weeks I’ve facilitated a series of center-based lessons for my 4th and 5th grade STEM students (@iesSTEM) in a unit I titled, “The Science & Technology of Sound & Music.” In addition to learning about sound and music, my students have been practicing ways to “document their learning” using text, images, and audio using KidBlog class websites and AudioBoo for short audio recordings. 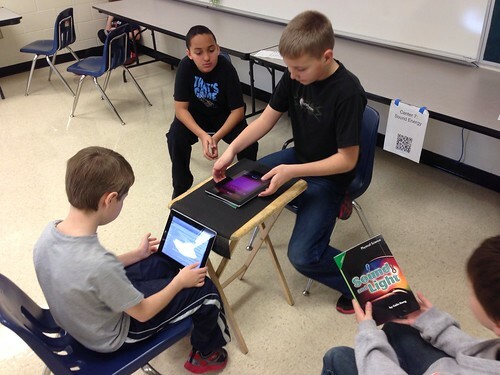 I have a cart of iPads in my classroom, so each group of 3-4 students used 2 iPads for different center activities and to document/reflect on center activities. 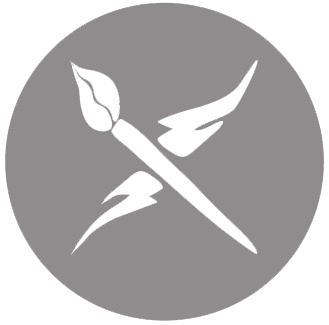 In this post I’ll share some of my lessons learned from this unit of learning. If you find any ideas in this unit or elsewhere on my STEM curriculum resources site, please use and modify it with attribution. 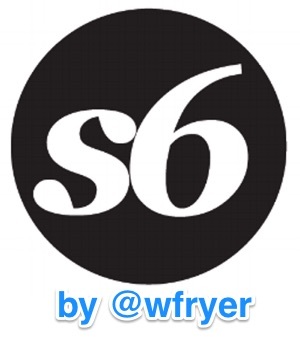 I’d also love to hear about your experiences via a blog comment or tweet to @wfryer! Since this will be a long list, I will start with my favorite lesson learned and AudioBoo recording of the entire unit. The lesson is: Providing different options for students to “document” and share their learning is essential. It’s not enough to just give students ONE choice, like insisting at every center that students ONLY can write an essay. Giving students the chance to capture and communicate things they are learning using images and audio as well as text opens the door to not only a larger quantity of student-created content during a lesson, but also higher quality sharing. The following 89 second recording from three of my fourth graders reflects MANY important “successes” from this learning unit. Showed their awareness of “an audience” outside the classroom who would listen to their “radio show” archive of learning. Exhibited enthusiasm for documenting their learning with audio. Worked to keep each other “on task” during their recording. Shared the microphone and the responsibility of sharing their learning equally among team members. Listened to each other and encouraged each other for their contributions to the recording. 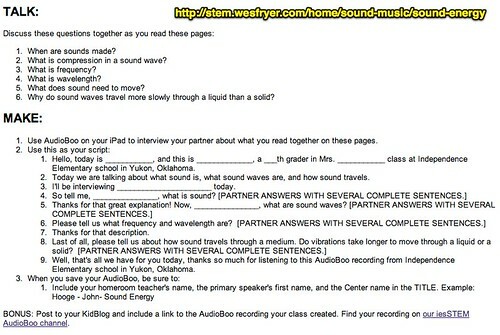 Demonstrated the value of AudioBoo in successfully recording and sharing thoughts quickly in a 20 minute center activity. While we certainly had our share of silliness and off-task behavior during our center activities (which is to be expected) we also had WONDERFUL moments of documented learning like this one. 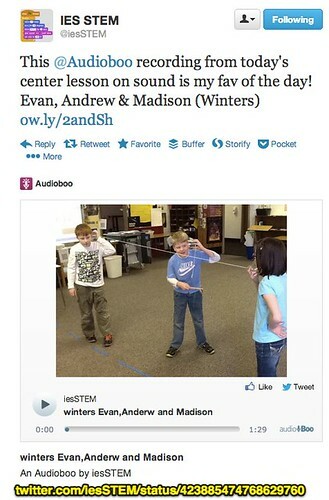 This AudioBoo made my week and is such a wonderful example of why inviting students to document and share their learning in class with MEDIA is so important. This was the first unit I’ve taught this school year in which I’ve used a series of videos to share instructions with students. At each center, I provided a QR code with the name of the center that students scanned using the i-Nigma app. 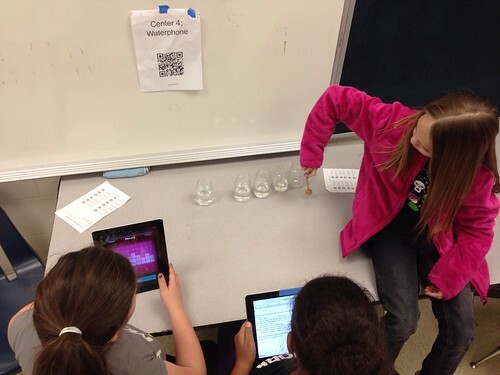 You can see the QR code behind and to the right of the students making a “radio show” recording in the photo below. By pre-recording my center instructions on video, I was trying to “duplicate myself” and provide students opportunities to learn what they needed to do at each center on their own time, and (if needed) repeatedly. This was my alternative to “direct instruction” at each center, and overall it worked very well. Most of these initial instructional videos, like the one for the “Measuring Sound with iPads” center, were shot by a student using my iPhone and immediately uploaded to YouTube via the free YouTube Capture app from Google without any edits/changes. One of the videos, for the “Step Sequencer” center which used the free iPad app Beatwave, was a bit more time-intensive to create. I used ScreenFlow software on my district-provided MacBook Air laptop, along with AirServer software to share my iPad screen, in the screencast video I created. That 2 minute screencast video took about 30 minutes to create and publish, since I made “post-production” additions to the video including text annotations. While the use of pre-recorded quick-edit videos and screencasts worked well in this unit, the volume from the built-in speakers of my classroom iPad2 tablets was often not loud enough for students. We adapted by moving to the hallway (where it was quieter) to listen to some of the videos, borrowing an external, battery-operated speaker from a neighboring teacher for one of the centers, and using the speaker in my desk computer’s monitor for another center. Ideally, it would be good to have headphones students could borrow to watch these videos, or speakers they could plug in and share when watching the videos. These are changes/additions to this unit I’ll consider for next time. When I initially placed centers in the two classrooms I have to teach STEM, I didn’t have a rationale in mind for which centers went in which rooms. The first lesson cycle, I quickly realized I needed to distribute the centers based on a few different factors. Some of the centers were definitely louder than others. 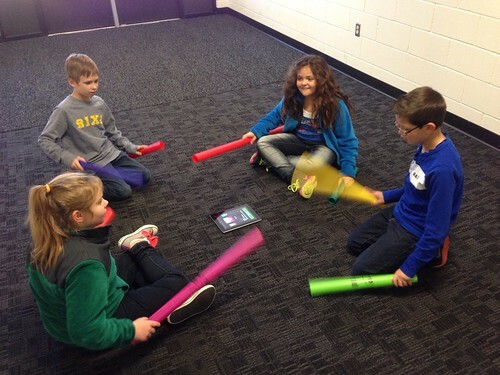 Since this was a unit on sound and music, students were using tuning forks, playing xylophones, and even making original songs using “boomwhackers” which I borrowed from our music teacher. As you can imagine, some of these centers got pretty loud. Fortunately my classroom is at the end of our school which doesn’t have many other classrooms, and I’m able to let students work in the hallway as well as in my classrooms. New classroom procedures take time for students as well as teachers to learn. As I expected, and I think all teachers should expect, some students handled the independence, freedom, and expected responsibility of learning centers better than others. It’s important to expect some discipline problems with some individual students and student groups, especially when teaching 11 classes including almost 300 students as I am this semester. It’s helpful to have consequences in mind beforehand and to discuss these with students in advance, or when an initial “intervention” is required because of off-task behavior. In just a few cases, I had to remove individual students from their group and have them “sit out” of the remainder of their center time because they continued to disrupt their group and ignore the prescribed activities of the center. This just happened the first day of our center activities, however. One of the hardest things about teaching is handling a discipline situation with one or a group of students, who repeatedly choose not to follow instructions and engage in off-task behavior, and then re-engage with other students who ARE on task and remain emotionally unaffected by the prior disciplinary interaction. My ability to do this varied during my classes, but overall got better as did the students’ abilities to keep their group partners on task. It takes time to establish new procedures for activities like centers, but the benefits are WELL worth the challenges. I know our center work will be easier and smoother next time because of the learning we did together over the past two weeks. I setup each class KidBlog for my students using their student ID numbers and the same userID / password syntax they use to login in our computer labs. Because of this, I have a list of each classes’ student userIDs and passwords. This is essential to have for elementary students, who inevitably (in some cases each class) forget their login credentials. It was helpful to pull up this spreadsheet on my laptop on my desk, and be able to direct students there to lookup their passwords when needed. 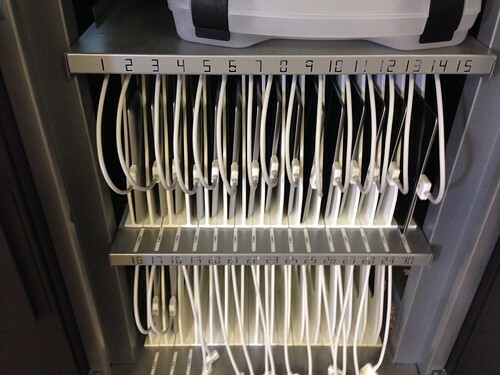 Each day of our unit, I had students check the iPads back into me to put back into our iPad cart at the end of the period so we had at least 3-5 minutes to debrief together. Since I had rearranged my classroom and pushed the student desks/tables to the edges, this allowed us to sit on the floor in a rough horseshoe. (I put some tape on the floor to direct students where to sit and provide a ‘buffer zone’ in front where I sat.) I LOVE changing the configuration of my classroom and providing opportunities to sit together on the floor for conversations. The power relationship between teacher and students is very different when you are sitting on the floor with students, or when you crouch down as a teacher when you have a short, disciplinary talk with an individual student. These changes of posture and position really matter. I found this debriefing time at the end of each lesson important and valuable, not only to let students re-cap some of their learning for the day but also to discuss group dynamics and ways they could work even more effectively with members of their groups the next day. I believe choice is a very important ingredient for effective classroom learning. Sometimes when we give a test or something else that is “mandatory” to students, they can’t have a choice. Other times, however, it is not only possible but also desirable to give students choices in their learning activities. Giving students choices increases their buy-in and gives them heightened agency in the classroom which is very important for building an empowered classroom culture. I let my students choose their groups for our student activities. Yes, this can lead to situations where a student doesn’t have a group, but in each case I helped that student find and choose a group to work with. I limited the number of changes in the groups once they were selected, because I want students to learn to work with others even when it is difficult. When there were major problems, however, I did allow students to change groups. 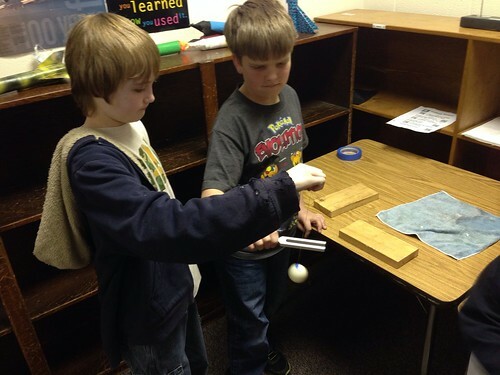 I built the activities for several of my centers using the FOSS Science Kit, “The Physics of Sound.” I actually watched part of an included VHS videotape to learn how to setup some of the activities, which is something I hadn’t done in a VERY long time! The FOSS kit activities and supplies were wonderful and very developmentally appropriate for my kids. I loved them and so did the kids. I plan on using more FOSS kit activities in the future. The 4-5 STEM teacher at our other 4-5 elementary school had this FOSS kit and loaned it to me for this unit. Since then, I’ve learned that some of the teachers in our building have other FOSS kits with different themes and I’m going to try and borrow them down the road. I consider myself to be capable of pretty effective “direct instruction,” but when you experience the differences in students learning between direct instruction and facilitating student center work it’s amazing to see the differences. Often when we “deliver” ideas to students (of any age) we think, as the teacher, that the students “are getting it,” but often they don’t. Learning can appear to be less organized and “messier” when students are engaged in center learning, but I’m convinced the learning is not only more fun: It’s also stickier and more effective. 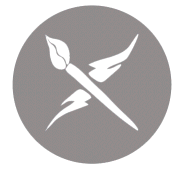 The proof is in the assessments of student learning, as reflected in the blog posts and audio recordings students created, in this case. 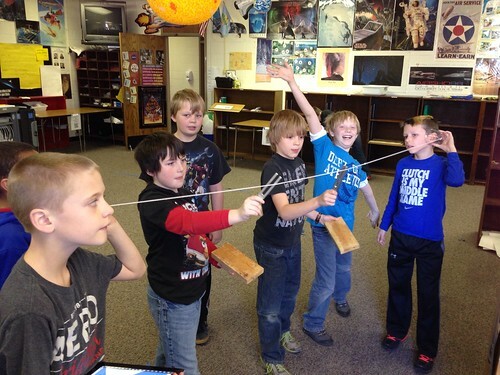 I encourage you to take on center-based learning in your own classroom! If these lessons learned were helpful to you, please let me know with a comment or tweet to @wfryer!